After serving in the Middle East during World War II, Stanislaus Rapotec immigrated to Australia, settling in Sydney in 1955. Rapotec was largely self-taught, inspired by the Byzantine masters, Greek mythology, architecture and the landscape of the Middle East. A pioneer of the abstract expressionist movement in Australia during the 1960s, Rapotec made a significant contribution to the Sydney art scene and was a vital member of the ‘Sydney 9’ group of artists, which included Peter Upward, Carl Plate and Clement Meadmore. His visual language of invented symbols and calligraphic gestures resulted in spiritually charged works, often recalling memories of his homeland in Slovenia. While Rapotec’s earlier work adopted the energetic brushwork associated with New York action painters such as Jackson Pollock, 'Spring' focuses on the miracle of the change of seasons and conveys a mood of quiet reflection and harmony. 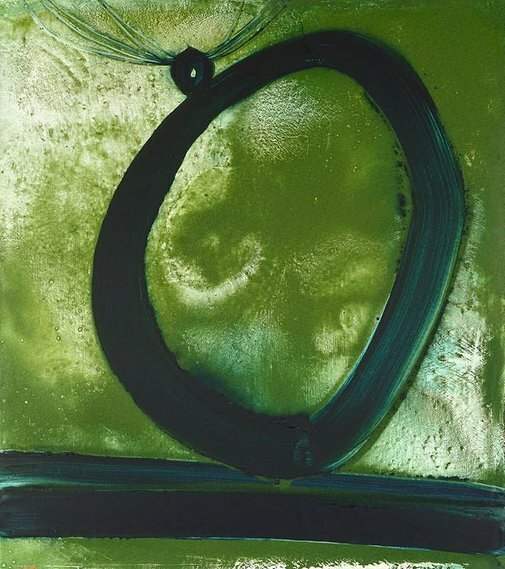 Signed and dated l.l., green synthetic polymer paint "68 Rapotec". Signed u.r. verso on support bar, black crayon "by Stanislaus Rapotec". Patrick White, painter, manqué: paintings, painters and their influence on his writing , Carlton, 2002, 149. Jill Sykes, Look , 'Raptoec and Vassilieff: How two émigré artists made their way in Australia', pg. 37-39, Sydney, May 2008, 37 (colour illus. ).